BROWNSBURG — A family grieving the loss of their 27-year-old daughter is at odds with the cemetery where she is buried. Tonya and Jay Warren lost daughter Sarah to a drug overdose in 2013. 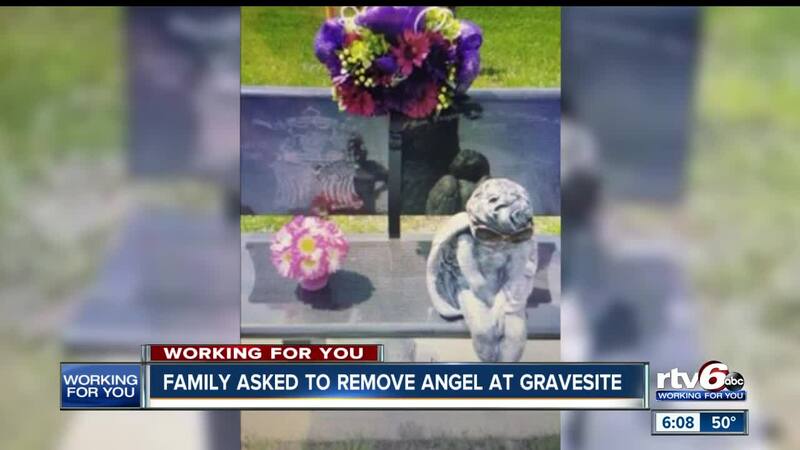 They placed an angel on her memorial at the Brownsburg cemetery only to learn it's against cemetery rules. It was a reminder of an angel the family had at home when Sarah was alive. "Sarah used to put sunglasses on it and put silly hats on him and now I do that with this angel. Well, used to," said Tonya Warren. Cemetery owner Bob Eastman says the angel had to be removed because it was sticking out and getting in the way of lawn crews. He was not willing to make an exception. "No, if I make an exception for them. I have to make it for them and them and them." Eastman said, while pointing to other gravesites. According to Eastman, the cemetery tried to work with the Warren family by creating a post for the angel to sit on. But Tonya Warren says that defeats the purpose because it blocks words on the bench that were planned to be visible around the angel. The family notes that the angel was on the memorial for four years and they were asked to remove it about one year ago. Since then, the two parties have been at odds and the angel is removed.